I am a fan of tankless water heaters. Who wouldn’t be when you consider all they have to offer? A tankless water heater saves space, and if your garage is anything like my garage, space is in short supply. Tankless water heaters save energy. Unlike their older siblings, tankless water heaters only use electricity or gas when it is needed rather than heating water in a tank all day to keep it hot when needed, even if you’re not home. Are you considering upgrading to a tankless water heater? Don’t – unless you’re going to take care of it. With your new tankless water heater, the supply of hot water is never-ending. Once you turn on the hot side of your faucet, the flow activates your water heater. Your heater jumps into action, igniting a flame or turning on the element to heat the water flowing through it and it even adjusts the flame or current based on how much demand is created. If two showers are turned on at the same time, the laundry is going, and the dishwasher is filling you will keep getting hot water until everyone, and everything is done. (Our blog here has more information and some of the limitations of installing an electric tankless water heater.) I wish tankless water heaters existed when my son was a teenager. You can probably relate if you have kids in the house, that kid would use up ALL of the hot water and leave none for anyone else. I would tell him to limit his shower to 20 minutes and to save some hot water for someone else in the family – yeah right! The unfortunate thing is there won’t be any payback, when his daughter is older he will have a tankless water heater and won’t have to suffer the curse that I put on him that when he had children, he would have to suffer what I suffered. Whether you have teenagers or perhaps you are a blue collar worker and need long hot showers to get cleaned up after a day of work, you can see certainly see the value of having an endless supply of hot water. If you have a large bathtub that you never use because it completely drains the water heater or you run out of hot water before it is even filled a tankless water heater could change that for you. If you have gas on demand water heater, the tub is going to be filled twice as fast as with an electric, but you are going to be able to fill that tub and never run out of hot water. Can you imagine? Using your roman or jetted tub again! Get that glass of wine and your book ready, if you upgrade to a tankless water heater, you will be using that bathtub on a regular basis to relax and unwind from the stress of life. I want to clarify that “on demand” water heaters can also refer to the small units that are placed at the point of use. For example, you can have a small water heater under your kitchen sink that is great for a cup of tea or a bowl of hot cereal. 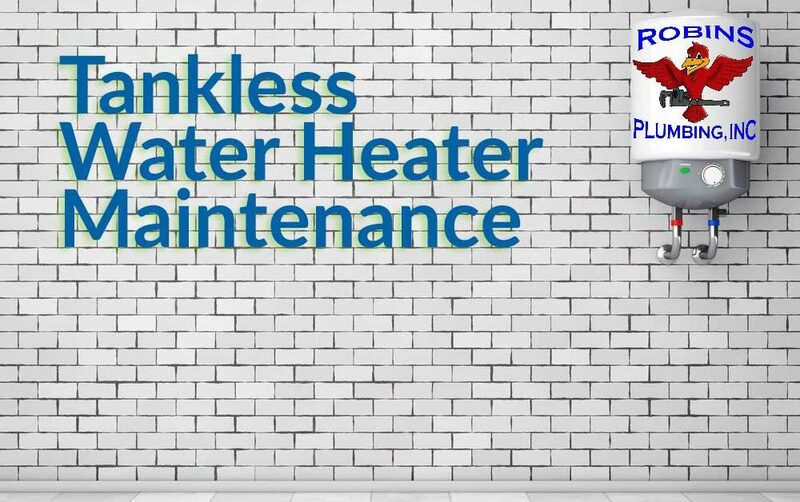 (For more information on these types of heaters, click here) Tankless water heaters are sometimes referred to as on-demand water heaters due to the accurate concept that they only heat water when the demand is there making it even more efficient if you travel or are gone for any extended period. The benefits of using a tankless water heater are not without one catch – maintenance. The thing is, the storage tank style water heater you have at home now also requires maintenance at least every year too, so this is not a negative factor. If both style water heaters require maintenance why am I harping on it here? Your tankless water heater will be an investment. They cost more than tank-style water heaters and if not properly maintained are a waste of money. Just like you wouldn’t buy a Tesla and not take care of it, the same holds true for the upgrade to a tankless water heater. Tankless style water heaters require more maintenance to work correctly. Maintenance is a common factor for all water heaters. However, there are some differences in the maintenance procedures and requirements. A standard storage water heater requires annual draining and flushing to prevent the buildup of sediment in the bottom of the tank; a tankless water heater also requires annual maintenance to prevent the buildup of sediment. One of the differences between classic water heaters and tankless is tankless water heater maintenance requires more equipment and is not easily performed by DIY. Flushing a classic tank style water heater simply requires a garden hose, knowhow, and patience, as long as the valves all work correctly. The equipment required for tankless water heater maintenance depends on if it was installed properly. Tankless water heaters should have maintenance valves. When Robins Plumbing provides and installs a tankless water heater, we also install these maintenance valves. These valves allow the cleaning solution to be pumped through the water heater to flush out all of the scales that have built up within the unit. In addition to needing maintenance valves to flush your system, you will also need a pump to pump the solution through the system, and this needs to be a pump that has only ever been used for anything but potable water, this means you DO NOT want to rent a pump because you DO NOT know where that thing has been! Seriously, pumps are used to pump out sewage, muddy water, pot holes in parking lots and many other things. You do not want to contaminate the potable water system for your home with a pump that has likely had sewage water going through it. Without maintenance valves, flushing your system is possible, but only if it has been plumbed in with flex lines and not hard piped. If you own a tankless water heater currently and maintenance valves have not yet been installed, call us today. We can get the maintenance valves installed up to code to make your investment easier to maintain and service. The hot side maintenance/service valve also has the connection for the pressure relief valve which is a requirement for every tankless water heater installation. If you do not currently have service valves on your tankless water heater as a top priority and consider this urgent, make sure that your system has a pressure relief valve installed. If a pressure relief valve is not installed, you are at risk of the system building up too much pressure, blowing up and flooding your home. Improper installation will also void your manufacturer warranty. The cleaning process and solution differ depending on the recommendations from the manufacturer. Sometimes there are differences between models from the same manufacturer. Along with flushing and descaling solution, there is also a filter on many tankless water heaters. This can be cleaned as often as you like but should be cleaned annually as a minimum requirement. Your tankless water heater may require more frequent cleanings depending on your water quality and hardness level. The tankless you install is a significant investment in your home. The maintenance helps descale the entire unit. Even if your tankless water heater is sitting next to a water conditioning system of some kind (click here to see our preference), it will still need maintenance to allow the most efficient transfer of heat from the flame or element to the water. The maintenance is all geared to remove scale. The scale is the enemy of efficiency and water heater lifespan. Scale is only good for dragons, not for your plumbing. Scale is created when minerals in the water form an ionic bond. You can see this in many houses. Look at the shower head, faucet spouts, or glass shower doors. This is very much like electroplating which is used to create jewelry when one metal is bound to another. In Phoenix, we get the privilege of having some of the wildest ionic charges we have ever seen, anywhere. Officially Phoenix water in 2017 had a hardness range of 9.2 to 16.5 according to the City of Phoenix water quality report, while the City of Glendale reports in 2016 15-20 grains per gallon. That is the grains per gallon rating, used when setting water softener levels. The strength of the charge and the amount of minerals we see settling in classic tank-style water heaters and binding on faucet aerators is not consistent with such a low hardness rating. To give you an idea of the strength of this charge, we often find “popcorn” growing on various components in a plumbing system. This is a white mineral building up anywhere water is making it out of the pressurized plumbing system. It looks just like the scale building on the aerators. Now to understand how strong the connection from one piece of mineral to another is, consider that mineral buildup can stop a pinhole leak. It is STOPPING the water from coming out. That mineral buildup is STOPPING the water from spraying and flooding. Try to hold your finger over the end of your hose while it is turned on to full pressure and you will give you an idea of the pressure this little layer of calcium and magnesium is stopping or slowing. If you see this white buildup on top of your water heater, on a valve or anywhere else, resist the temptation to touch it. If you brush this mineral buildup from the affected area, you may start a leak. If you see this white buildup on your plumbing call Robins Plumbing, this mineral buildup is the sign of a leak that is being held from mineral buildup. The point is, this scale is building up quickly, especially on your tankless water heater since the piping inside of them has a smaller diameter than a standard water heater. If it builds up all along your heat exchange system, the efficiency is dropping and left uncleaned will destroy your tankless water heater. The cold water moving through the system triggers the fire, the fire starts heating the metal, and now instead of heating the water, it has to heat up the minerals first. The thicker this mineral becomes, the harder the water heater has to work to provide the temperature output you want. If the minerals become thick enough it will also affect the amount of water that goes through at once, reducing your flow. If you have a tank style gas water heater, you may have already heard this occurring. Do you hear popping noises coming from your water heater when it is heating? That is part of the reason we call it popcorn. Whether you already own a classic tank style water heater or are considering investing in endless hot water, there is maintenance to be considered. 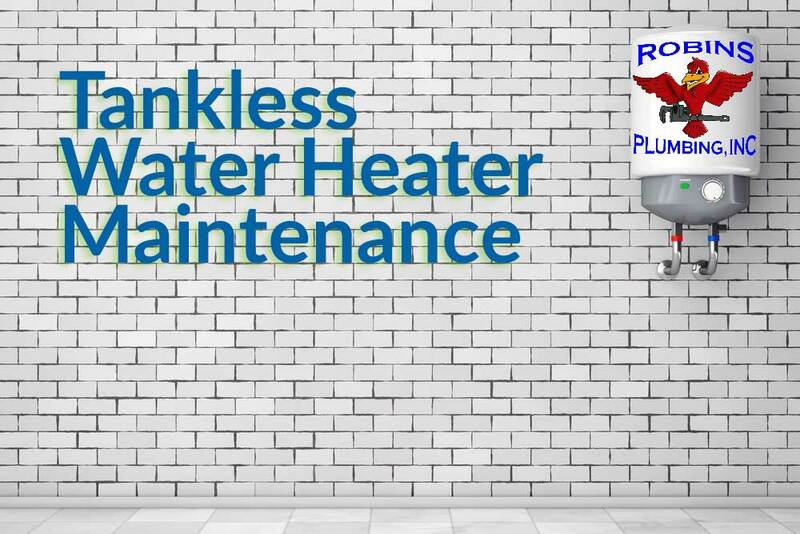 With the proper preparation, tankless water heater maintenance is a once year phone call to Robins Plumbing, and you can call us to help with your current water heater too.